Use the Nintendo DSi Camera to capture your face, and take part in flight missions controlling your glider simply by moving your head. Tilt from side to side to steer, pull back to climb and forward to dive. 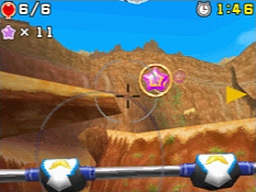 Your missions include bursting balloons on your way to the goal or collecting hidden stars dotted around the landscape. There are 15 stages in total, each requiring you to meet several criteria to earn medals that unlock more stages and gliders.